Latest news and information will appear below. Archive News Pages here Lets Go Karting, Junior Practice School and ARKS Schools at Shenington see further down the page. For ARKS Tests or to book a pit space: Book with Tom Whitehouse tel 01926 496694 / 07825 771782. The Annual General Meeting was held at the circuit at 7.30pm on Tuesday 6th May, we had one new offer to join the committee, the remainder of the committee was re-elected with the exception of Stuart Ziemelis who has resigned due to work committments. Please do not drive through Shenington village to and from the circuit. Only go to the village if you are using the facilities there. Thank you. Please note that the Shenington village parish council in conjunction with the Police are carrying out speed checks in the village and on a recent karting weekend 44 out of 66 vehicles checked were speeding. You have been warned, do not come through the village and DO NOT SPEED in any villages or towns. Also an increase in road side litter has been noted on karting weekends, please take your litter home. We shall be using the TAG Heuer timing system in 2014, you can order your TAG Transponder through the club, and pay in easy stages. Webcam is here. Note that the draft requlations for the SuperPrix, ABkC TKM O Plate and 250 National Super 4 in June are on the Forms Page. 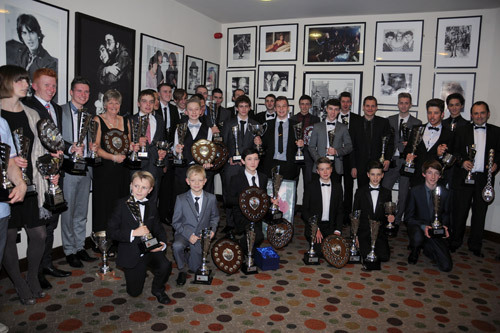 JLT/MSA Motor Club of the Year Award: Shenington was chosen out of all 750 motor clubs to take 1st prize in the 2012 JLT/MSA Club of the Year. The then Chairman Mike Coombs and Secretary Graham Smith attended the MSA Night of Champions at Pall Mall to receive the large rosebowl trophy and cheque. This is a tremendous achievement, earned through our members support. See picture to the right. Club Meetings will be on the 3rd Sunday of every month from January to November, then 1st Sunday in December. For Regulations go to 'The Club', then 'Regulations' on the menu. 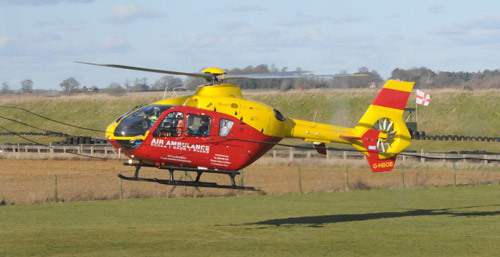 We are still collecting for the Oxford Air Ambulance if you can help. Please support the Air Ambulance and you might also be interested in signing the petition to exempt them from fuel duty, which is here. (In the same way that Lifeboats are exempt). Please take more care exiting from the circuit, there was nearly a serious accident after the January meeting, and please DO NOT allow your supporters to park on the public road. Parents of minors: If you are handing responsibility for another person to sign on your child up to 18, you will need to complete this form and leave it with the club at signing on. Pit Spaces for the next Meeting: Please inform Tom Whitehouse if you are racing at the club meetings and will not arrive until late Saturday or Sunday morning so he can rope it off to prevent anyone else going in. Also note NO CARS in the pits spaces unless sole means of bringing your kart. Please have your fire extinguishers ready for inspection if requested. You will be asked to move if in a booked pit space by mistake. Booked pit spaces are £20 per weekend, this applies to any pre-booked with the track manager or to the 'choice' spaces released by club members for the weekend. Un-booked pit spaces that have not been pre-booked or do not belong to a club member for the year are not charged. Always check the notice board and if in doubt see the officials. Spellfame Shenington SuperPrix 2013: Thanks to everyone who made the weekend such a massive success with 240 competitors. Congratulations to Clayton Ravenscroft who won the Gil Rixon Driver of the Day trophy, and to ABkC O Plate winners Henry Easthope (KZ2 UK) and James Hassall (250 National). Where else could you see two FIA World Champions competing, Henry one, Jake Dennis winning Rotax Max. 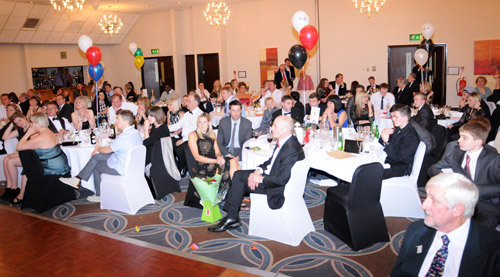 Pictures now on the results page. For pictures of the historic and classic karts click here. LATE ARRIVALS: Please do not come to the circuit on the day / evening before a practice day or championship, except up to 11 pm on Friday's before the club meetings. Our landlord and the Gliding Club are getting fed up with vehicles trying to get in or parking in the area late at night. 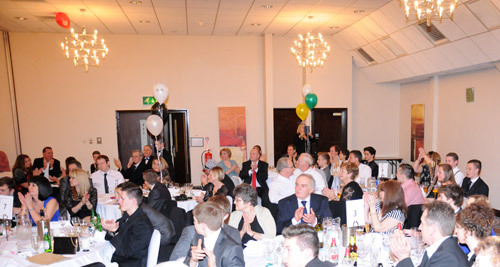 PIT-SPACES: Could visitors to the club please respect the pit spaces that are booked for the year by the club members. If in doubt, look at the notice boards in the paddock to see which are occupied. The owner of the pit-space always has precedence up to 0915 on Sunday morning. Please note that if a pit bay holder is not using the pit bay for a race weekend, if they inform Tom Whitehouse the club will attempt to sell the space for £20 for the weekend and if sold, give a £10 discount voucher to be used against a test day in the future. Vacant pit spaces can be pre-booked for a weekend at £20 by contacting Tom Whitehouse on 01926 496694 / 07825 771782 at reasonable times. CCTV is in operation: The club has invested in a CCTV system to aid the Clerk of the Course in judicial decisions on driving incidents. There are a total of eleven cameras (two in the paddock, up to nine on the track) in operation. Live Results are here: This is rarely used but if active you should be able to see the unofficial race results 'over the line' from our Super Sports Timing System possibly before penalties are added, with unofficial timing. Take your ARKS test with one of our Club Examiners (Tom Whitehouse tel 01926 496694 / 07825 771782) and join the club at full annual price (£70) and you will receive ONE FREE RACE ENTRY in 2014. 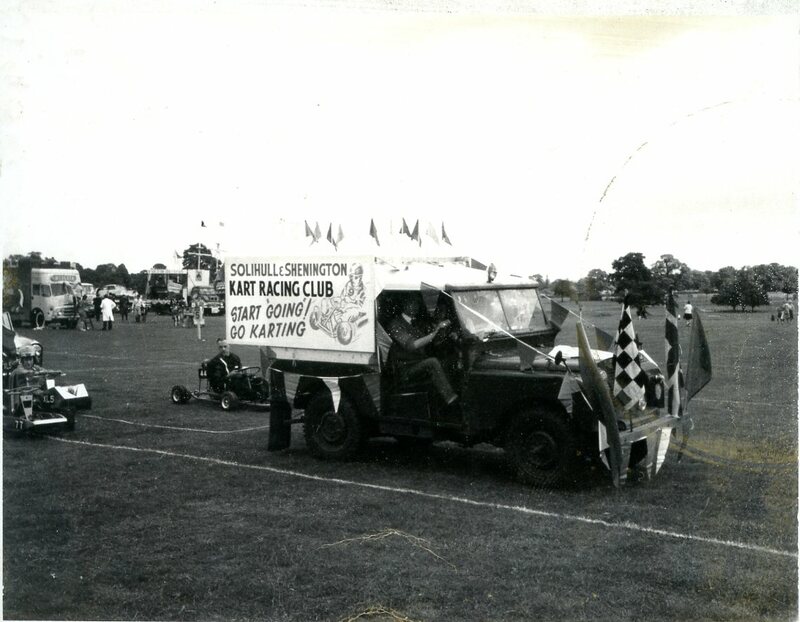 Video of a Lets Go Karting taster session and some Cadet Racing from Shenington in 2009 , and below a picture of the club's start karting in the Sixties. 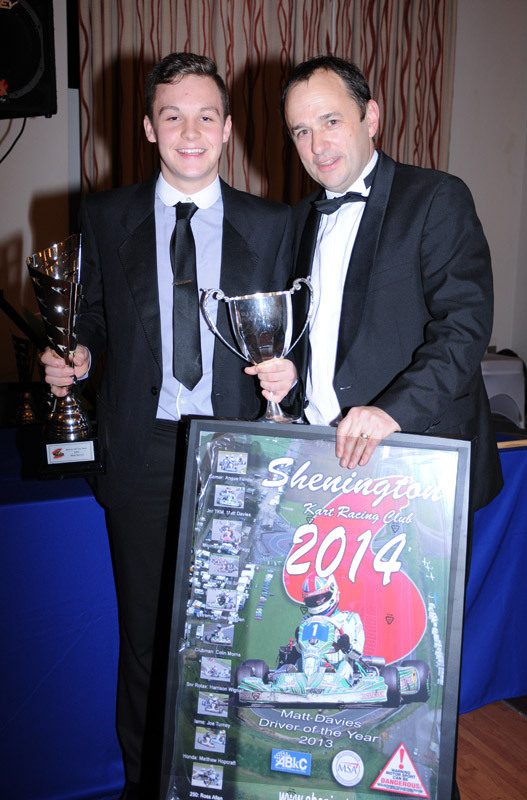 Go Motorsport: Shenington Kart Racing Club supports the MSA Go Motorsport scheme. WiFi Broadband Internet Access: As part of the continuing service to our customers / club members / drivers we have now made available WiFi access in the paddock. It covers almost all of the B and C pits, and the some of the new field, and the lower part of the A Pits. We also have live timing available and the webcam(s). Please do not abuse the facility with over-use (eg gaming) or we may have to put on password protection. Just treat the free internet access with respect, thank-you. Fire Extinguishers: Could all competitors please ensure they have a working fire extinguisher at the race meetings in accordance with regulations, minimum size 55B but better to be 70B minimum. Also please acquaint yourselves with the nearest firepoint in the paddock where large fire extinguishers may be found. If you have an awning, it is now recommended to have a minimum of a 2kg foam or powder, or two if more than one competitor. Commercial teams should have a minimum of 2 x 6kg and the fire extinguishers should be kept at the entrance(s) to the awnings. Please put your entries in ON TIME! At a recent meeting there were 176 sent on time and 64 AFTER the closing date. Remember we are allowed to charge £10 for late entries. ROTAX MAX DD2: The club welcome DD2 at our test days but please note all DD2 karts must practice in the gearbox sessions. Our insurance does not permit us to mix gearbox and direct-drive and because the MSA recognise DD2 as a gearbox category, they must therefore set their gearing for the long circuit and practise accordingly with 125 KZ UK etc. IF there is sufficient demand we can consider a race as they are already referenced in our SRs. Please note—reluctantly we can no longer accept used tyres. Too many people from all over were using our facility, not just club members. So it is exclusion for anyone dumping tyres at Sheni from now on. We use the TAG-Heuer and Apex timing system supplied by Sports Timing Systems Ltd, all results and live timing will be available on their dedicated website. and all meetings will sport the ERS+ results on www.karting.co.uk . This should be of great benefit to the club members and guests, being able to bring up various statistics on www.karting.co.uk website. Yet another update and improvement from your favourite club. Remember all profits are put back into the club facilities. Please note the MSA Gold and Blue Book are available on the www.msauk.org website for download in pdf format. If you do not have a licence and password, it is now possible to get a public access password. Race Track and banks: Please note the club is now enforcing the rule that there is no access to the race track without official permission, even after racing or practising is finished. This is because of complaints from the glider club of children throwing stones over the banks onto the glider club runways and equipment. Please do not allow your children to go onto the race circuit at any time, no cycling, playing etc. Drivers may walk round the circuit before practise or racing. Perimeter Gate: Please note that the outside gate is locked between 11 pm and 7 am on race weekends. But there is an adjacent pedestrian gate to allow access or for emergencies. Toilet & Shower opening times: Clubhouse toilets & shower will be closed between 2315 & 0715 but will not always be open evenings of or prior to mid-week testing, although the old toilets will be. 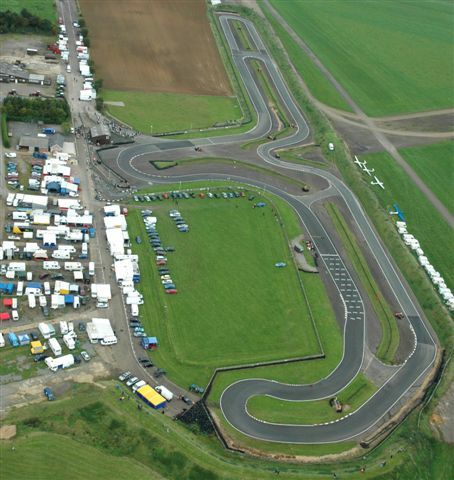 Shenington Kart Racing Circuit is one of the more popular in the UK, and hosts events for all of the ABkC classes. Based around Shenington Airfield this circuit is strikingly flat and offers good viewing facilities for spectators accompanied by good facilities including toilets and the obligatory café. Karting tuition is offered by Protrain and Ziemelis Kart Schools. ARKS tests are also carried out by the club, contact Tom Whitehouse on 01926 496694. Useful information on Starting Karting. Spectators are admitted at £5 per car. There will be three heats (whenever possible - two in winter months) and a final.